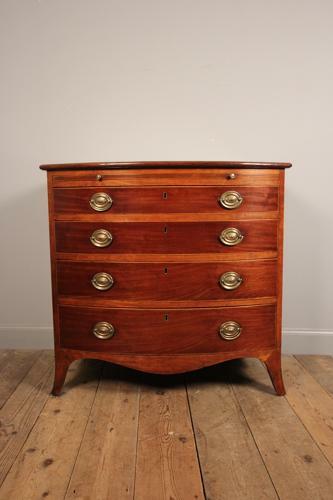 A small Mahogany bowfront chest of drawers from the Regency period, beautifully mahogany lined with an arrangement of a brushing slide and 4 graduated drawers. Having neat proportions with satinwood cross-banding and retaining the original brass handles, escutcheons and locks. The whole raised on shaped splay feet. Superb quality throughout with good colour and luster. English, Circa 1810.